Families sell their homes for many different reasons. Some people fancy a change and wish to move on to bigger and better things. Others may be finding it hard to cope with the bills and need to free up some of the money that is tied into the house. Selling up to move into a smaller and cheaper home can make a big difference to the household finances and quality of life. Whatever the reason for selling may be it is often frustrating for the sellers who want to get the new chapter in their lives started. The housing market is slow at the moment and many home owners are dropping the prices down by thousands simply to get a sale. After waiting many months, even years, it sometimes feels like the only option is to offer a deal that can’t be ignored. This is not a great position to find yourself in. If you are selling up you can do it quickly if you know how. There are easy options available to everyone regardless of their location, status or the property. House buying companies are happy to come and complete the sale of your home quickly and without all the fuss that comes with putting it on the market or using an estate agent. Companies such as the House Buyer Bureau specialise in buying homes at competitive prices and the paper work can be signed in as little as seven days. If you are not sure whether selling to a house buying firm is for you the alternatives may take a lot more time to complete. You can choose to sell your home privately or use an estate agent who will take a fee from the sale of the house and charge for additional services. Be sure that you spend time working on the property to bring it up to a good standard. Home buyers are put off if they suspect that the house may have problems. All those little jobs you’ve been putting off should be attended to before anyone comes and has a look round. If your house has been on the market for some time consider using the House Buyer Bureau. They make the process as easy as possible and will act professionally and quickly so you are able to move on with your life. 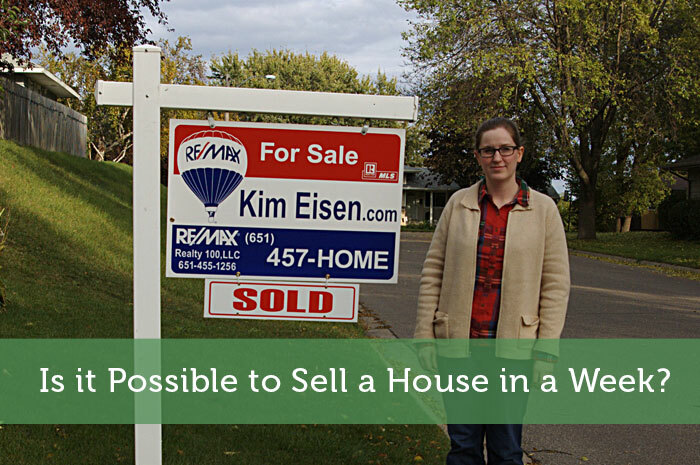 Is it Possible to Sell a House in a Week? It depends on the market. I think it’s possible to sell within a week, but it also depends on how you are priced compared to comparable homes. I’ve heard of home buying companies, too. For sure..the market does play a huge role in how quickly you can sell. It just seems that you’d be able to sell it for higher if you had more time. Definitely possible to sell in a week if you are priced right. The market is actually getting pretty hot and home prices are starting to rise nicely. Here in Vancouver I do see some homes stay on the market for a very short period of time. It all comes down to what you’re selling and for how much. It really forces buyers to stay on top of the market if they want the best deal. Back a few years ago when I put my house up for sale I had a buyer willing to make a deal and I turned it down because I thought I could get more. Turns out I wasn’t able to find another buyer till a year later and it was only a $1000 more than the offer before that. I guess hind site is always 20/20 but I wish I would have taken the first offer. That kind of situation must happen all the time. Sometimes it does work out that the early offer is the one that you should’ve taken. Absurd pricing probably makes this possible, as well as extraordinary luck (although location and market will also have say). That absurd pricing just doesn’t seem worthwhile to do. If you instead were able to be more flexible with the timing, the price could be a lot better. That would be a bit strange to get an offer on your home when it’s not for sale. Sometimes the numbers just might make enough sense to take the offer. Then again if someone is offering out the blue, you could probably get more if you actually put it on the market.